A smile of gratitude and hopefulness - "Thank you Trinidad"
Feb 15th 2010: The first three of eight containers packed with relief supplies by the Muslims of Trinidad and Tobago have arrived over the weekend in Port-au-Prince. These supplies were obtained by the community collection of various points on the island. Additional supplies were purchased with funding received locally and from regional partner Central Islamic Organization (CIOG) of Guyana and hemispheric neighbours Human Concern International (HCI), ISNA Canada and the Muslim Welfare Centre of Canada The containers were accompanied by a team of Muslims from Trinidad who ensured the timely clearing of the containers at Santo Domingo in the neighbouring Dominican Republic before arranging transportation across land to Port-Au-Prince. Here the supplies were temporarily stored at Masjid Tawhid from where it was quickly distributed to other masjids in Port-au-Prince, two churches, a lady who takes care of twenty-one families with a lot of babies and some medicines were given to a team of doctors from Canada. The Trinidad team is back in Santo Domingo today, await the arrival of the next five containers on Wednesday before heading back to Haiti to distribute these much needed and anticipated supplies. 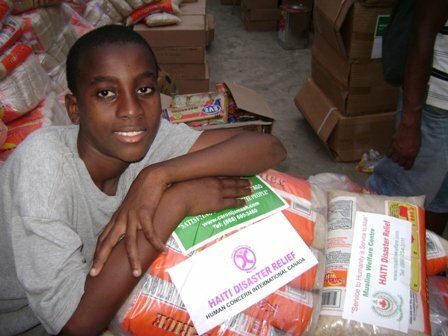 Be the first to comment on "More aid pour in to Haiti from regional Muslim neighbours"